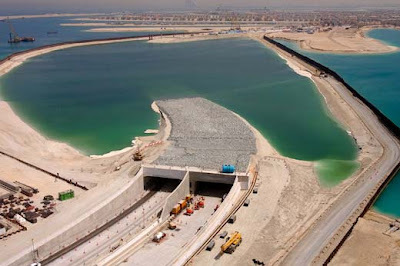 Dubai projects continue to amaze the world.Now I'm again amazed by this project, a sub-sea tunnel.The 1.4km sub-sea tunnel project on The Palm Jumeirah is approaching completion with the waters of the Arabian Gulf now entirely submerging the tunnel. The 38m-wide tunnel connects the tip of the island’s trunk to the crescent and will ultimately provide transport access for those wishing to visit more than 20 five star hotels that will be located on the island’s breakwater. The entire project is expected to be completed in May 2007. See other amazing dubai projects.